Kerala chief minister Pinarayi Vijayan stated that the BJP wants to destroy law and order of the state. He even threatened to arrest the protesters and criticised BJP's suggestion of implementing President's rule in the state. BJP activists call him a liar stating that the onus is on the common man to address the problems of the state. Thiruvananthapuram: Kerala chief minister Pinarayi Vijayan said to media that BJP's Presidential rule is unwanted in Kerala. Pinarayi Vijayan was talking to media about the BJP's comment in Lok Sabha to implement President's rule in Kerala. "The protesters partaking in the hartal will be definitely arrested. In Kerala, protestors will be arrested, the Centre may go and inform the other states not to arrest the protestors," said Vijayan in the press meet. The chief minister also stated that the BJP wants to destroy law and order of the state and that 92% of the violence was carried out by the Sangh Parivar in the region. BJP hit back, claiming that Vijayan is not capable of handling the problems of the state. "If the leader doesn't have the courtesy to look after the state then it's the common man's duty to take care of the problems of the state," said Abhijith Krishna, an RSS activist. Vijayan also pointed out many incidents such as attacks in Thalassery, which includes the attack on CPI(M) activist Sobha. He also mentioned the attack on Dinesh Beedi Company. The chief minister also mocked Sangh Parivar by saying that the party won't get any protection in Kerala like the other states. Calling Vijayan a liar, the BJP too raked u those incidents to highlight Vajayan's wrongdoings. "Who is going to believe Pinarayi Vijayan's words. He is a big liar. He blamed Sangh Parivar, why is he not speaking about the death of Unnithan, who died because of CPI(M) members pelted stones. Vijayan has no comments on this, and this shows how he is and who he is," said Rupesh Chirakkal, an activist. Meanwhile, bombs were hurled at the houses of CPI(M) and BJP leaders in Koyilandy. Houses of CPI(M) leader K Shiju and corporation education standing committee chairman, and VK Mukundan, BJP mandalam secretary, were attacked. The bomb was hurled at the house of CPI(M( leader early on Tuesday morning (3 AM). A bomb was thrown at the house of Mukundan at 5 AM this morning. The window panes of the house and doors were damaged. No casualty has been reported yet. At the same time, many Ayyappa devotees have said that the CPI(M), under the leadership of Pinarayi Vijayan, has been bulldozing its way into the Lord’s abode. Some have even demanded the resignation of the Kerala chief minister following the Sabarimala fiasco. 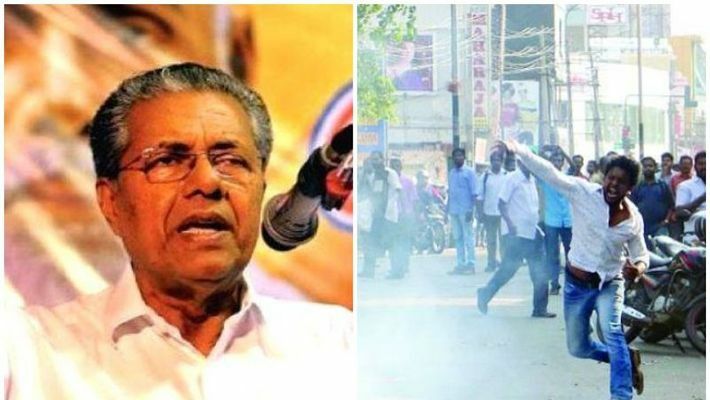 According to police sources, a total of around 2182 cases have been registered and about 6714 arrests have been made in connection with the violent protests in Kerala.